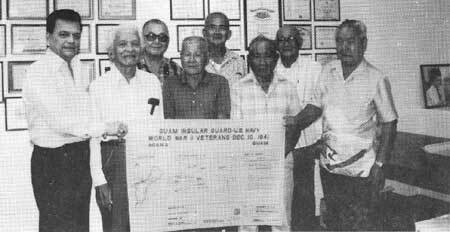 Some surviving members of the Insular Forces Guard (from left) with Senator Eddie Duenas: Pedro G. Cruz, Eduardo C. Estaquio, Jose (Joseph) D. Santos, Juan F. Perez, Jose C. Fejeran, Hipolito P. Lizama, and Jesus S. Perez. PFC William W. Bomar, Jr.
LT G.P. Bright (SC) U.S.N. LT A.J. Carlson (SC) U.S.N. Ensign F. J. Carney (CEC) U.S.N. LT(jg) J.E. Davis (ChC) U.S.N. LT CMDR P. Graf U.S.N. Pay Clerk R.C. Haun U.S.N. Ensign J. Martin (SC) U.S.N.R. Ensign H.R. Mellon (SC) U.S.N.R. LT CMDR S.A. Newman U.S.N.R. F2c James Madison Smith, Jr.
PhM3c Peter B. Marshall, Jr.
PFFC Charlie A. Combs, Jr.
PFFC Garth G. Dunn, Jr.
1st LT C.S. Todd U.S.M.C. PFC Sam L. Cohen, Jr.
PVT Wynn T. Moss, Jr.
PVT Luther D. Orr, Jr.
PVT Edward J. Spellman, Jr.
PFC George R. Summers, Jr.